I should have posted these last week....but better late than never, right? 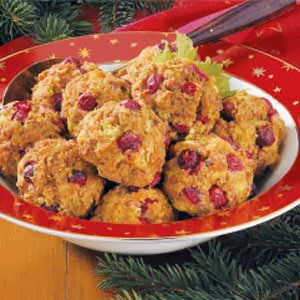 These turkey stuffing balls are a great way to incorporate Thanksgiving into your tailgate. Directions: In a large skillet, cook the ground turkey, celery and onion over medium heat until meat is no longer pink; drain. In a large bowl, combine eggs, broth and stuffing; let stand for 5 minutes. Stir in turkey mixture and cranberries. Shape into 12 balls and place in a greased 11-in. x 7-in. baking dish. Bake, uncovered, at 325° for 35-40 minutes or until heated through.